Cracking the China Market, Then and Now U.S. businessman Carl Crow arrived in Shanghai in 1911. His blockbuster 1937 book, 400 Million Customers, recently has spawned a crop of imitators, and many of his insights into doing business in China still hold true today. The latest guru to inspire a crop of books about doing business in China died 60 years ago. Carl Crow was an American advertising agent who arrived in Shanghai in 1911 with one suitcase, and stayed three decades. 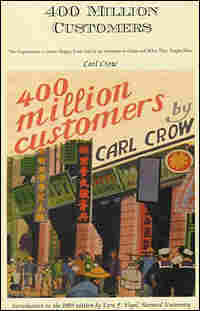 His book 400 Million Customers was a blockbuster hit in 1937, and recently has spawned a crop of modern-day imitators. Many of his insights about Chinese customers — and doing business in the Middle Kingdom — still hold true today, despite a half-century of communist rule. Business deals in China are always full of surprises, because, until the transaction is finally concluded and the goods or service paid for and consumed or performed, no one can be ever quite sure that all the details of the transaction have been settled, and that there will be no misunderstandings. Many authorities contend that the Chinese have a genius for misunderstanding which works to their advantage in many lines and that it is especially advantageous to them in matters connected with travel or in bargains with the inexperienced. In fact, in most of the deals undertaken by the stranger, the one thing that he can be certain of is that, when the time comes to pay, the price which has been definitely agreed upon has for one very plausible reason or another been increased. It appears to be impossible to foresee all the twists and turns that force majeure or the acts of God may take, and they invariably turn out the disadvantage of the party to the contract whose function is to pay the money. Chair bearers who carry you over hilly or mountainous roads are notoriously skillful at wangling extra money in this way and many travelers have suffered at their hands. Of course, if one jumps into a chair as into a licensed taxicab and starts on a journey without having a definite understanding as to how many coolies are to be employed for each chair, the route to be taken, the number of stops to be made, the time to be spent at each stop, the amount to be paid per chair, whether or not the lunch basket and other light luggage is to be carried in a separate chair, and the wine money allowance for each coolie, he has made a very careless contract in which there are plenty of loopholes for honest differences of opinion to say nothing of dishonest ones.